Visit Spokane is pleased to announce that one of the region&apos;s hotels, Quality Inn Downtown 4th Ave, has been awarded the 2015 Gold Hospitality Award from Choice Hotels International. The award is determined by hotels that are ranked in the top 10% of all 6,300 Choice Hotels across the nation. The Quality Inn Downtown 4th Ave was placed in the top 10% based on customer surveys, meeting brand standards and reviews from travel websites such as TripAdvisor and Yelp. "This is a significant award as it&apos;s based on guest feedback and ratings," said Travis Tramp, District Manager for the Quality Inn Downtown 4th Ave. "To be received with such high esteem by our guests means that we are doing our job and providing the ultimate customer experience." The 2015 Gold Hospitality Award is based on the 2014 performance ratings. 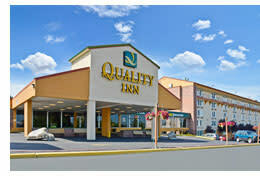 To find out more about Quality Inn Downtown 4th Ave, visit QualityInn.com/Hotel/WA181. *Figures provided by Dean Runyan Associates report for the year ending 2013.